KATHERINE JACOBSON FLEISHER's international performing career as a soloist, duo pianist and chamber musician has received critical acclaim. Her recent Carnegie Hall debut, with piano partner Leon Fleisher was praised by The New York Times for its "abundant musicality and refined technique". Leading orchestras with which she has performed include the Philadelphia Orchestra, Chicago Symphony Orchestra at Ravinia, Baltimore Symphony Orchestra, Gulbenkian Orchestra of Portugal, and the Orchestre National d'Ile de France. This season she will concertize in Japan, Germany, and France, as well as the United States. Ms. Jacobson Fleisher gave the North American premiere of the Concertino for Piano and Chamber Orchestra by the late Greek Cypriot composer Phanos Dymiotis (Leon Fleisher, conducting). Emphasizing the importance of the music of our own time, she has commissioned works by contemporary women composers such as Dina Koston and Luna Pearl Woolf, most recently performing chamber music of Dina Koston in Carnegie Hall's Zankel Hall. Her major musical influence was Leon Fleisher, with whom she worked at the Peabody Conservatory of Music. At the Cleveland Institute of Music, she received her master of music degree studying with the renowned duo piano team of Vronsky and Babin. Prior to attending the Cleveland Institute of Music, Ms. Jacobson Fleisher graduated from St. Olaf College, receiving her bachelor of music degree. 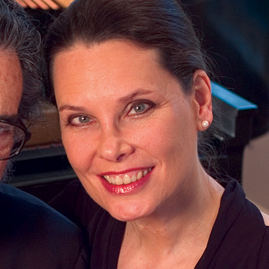 Ms. Jacobson Fleisher performs solo and duo piano concerts worldwide with her husband, pianist and conductor Leon Fleisher.